This eye-catching and cozy three-piece bedding collection features a stylish comforter with a paisley pattern in striking hues of blue and taupe. Coordinating shams help you create a cohesive space fit for a king or queen, while a cotton construction helps ensure softness and makes the set machine washable. This is exactly the print I was looking for and I love it, BUT there is no stitching on the comforter therefore what's inside has shifted. It now looks dingy and cheap and isn't full like it was when I purchased it. Very disappointing! I was looking for these specific colors. I am happy with this purchase. The design is fuzzy so don't think you are getting crisp edges, but I like the look. I also like the cotton material which is much more durable than microfiber comforters. Well made. I recommend this bedspread. Loved the colors, exactly what I was looking for and I redecorated my entire bedroom around it. Purchased grasscloth to paper a couple walls that matched it perfectly. Also painted and purchased new Bali blinds, artwork, lamps, etc. I spent a small fortune for a beautiful bedroom and now the comforter looks like cheap crap! So disappointed, there is no stitching to keep the batting or filling in place and now it is all bunched up. I've never washed it and will never be able to or it will just be a big wad of cloth. I'm now trying to find another comforter or bedspread with the same colors to keep my room cohesive. Very disappointeod in Overstock for this purchase. This has been one of my favorite purchases from Overstock. That is saying a lot because we were victims of the Louisiana floods in August of 2016 and lost most of our belongings. We have had to make a lot of purchases unexpectedly (thank you Overstock for my credit card - I couldn’t have put this house back together without it) so I received a lot of items at once. This comforter set has been one of the best choices I made. It has the appearance of a duvet cover even though it’s really a comforter because the stitching is only seen from the bottom. The colors are soft and muted - not bold. It looks really nice against my gray walls and dark headboard. I purchased three of the coordinating seafoam colored euro shams for my king sized bed and I added a light navy colored blanket at the foot of the bed. Very easy to spot clean, not too heavy and not too light - have now used during all seasons. Very happy with comforter set - colors are exactly what I wanted. Perfect thickness, and cool all cotton texture. 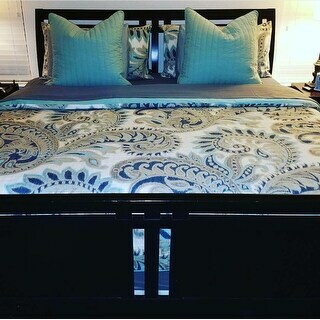 This is second set I purchased for my bedroom and the colors are beautiful not to mention the comforter is high quality and machine washable. The previous comforter bought from elsewhere is not machine washable needless to say it is ruined and was more expensive. Love this set. I loved this set for our guest room, I bought two sets! It has beautiful, upt to date, crisp, clear colors that easily coordinate with many neutral wall colors. It's really easy to coordinate additional pillows and sheet sets with this comforter set. The fabric is super soft and cozy - not at all scratchy or pilly. I recommend this for anyone wanting to update their look on a budget! Very happy with this comforter set. 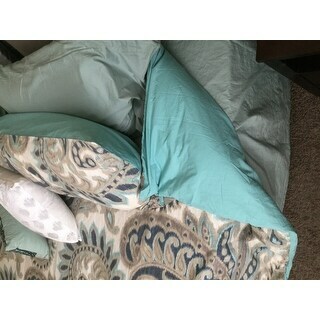 The under side is more of a teal color, but the accent euro pillow shams & decorative pillows in the paler shade of sea foam which is almost a mint green but not, compliments very well. I purchased both the ink & ivy matching sheet sets in navy & sea foam. I love this set. Very attractive and good quality. Love the colors in this set! It looks great except the comforter is not long enough on the sides for my king-size bed. Like other reviews, I wish the layers were sewn together instead of loose. It would have a neater look. All-in-all, I am pleased with the set. Good quality - not cheap-looking. I love the style and colors of this set. Only strange thing is it feels like a duvet cover .... like the comforter inside doesn't reach the ends of the duvet. Other than that, very pleased. Looks great on our bed!!! "What sheet set is used with this set? Looking for that exact color sheet set "
Unfortunately, we do not currently carry the sheets. "Where can I get the aqua shams that match this comforter set? " Unfortunately, the coordinating accessories are currently unavailable within our inventory. "Does this have teal in it?" 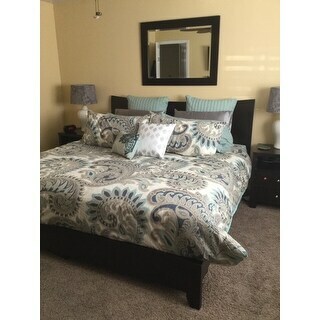 This comforter set is aqua, navy blue and taupe. "Is the background white or off-white? Thanks, Patrice"
The background is definitely off-white, more of a beige. Looks much different than the picture, less contrast between background color and pattern, but is still very beautiful. I love it and would highly recommend unless you are wanting a white background. "Does this comforter have any areas that are sewn all the way through the top of comforter to keep top layer in place and prevent shifting of the fill?" This comforter has 6 vertical seam to secure the filling in each row. Thus the filling in the comforter will stay intact and minimize shifting. Mine doesn't have the stitching they're referring to. I'm very unhappy with this because the inside of the comforter has shifted and I can't get it back like it was. One side is really full and the other side looks empty like there's no stuffing in it. Very disappointing. "Are the throw pillows available that are shown in this picture?" You can find those throw pillows under item# 17160713, 17160794, 17160778 and 17160710.